I woke up at 8:30 on Saturday and started working on the blog for Friday’s game at 9:00. At 11:15 Dave came into the basement and said we were getting kicked out because Annette’s fraternity (it’s co-ed) was doing an initiation at the house. I quickly got ready and Dave and I drove to the Taco Mac nearest to his house. Dave and Bill love Taco Mac (see the 4-13 post if you don’t know who Dave and Bill are). Taco Mac sounds like it would be a Mexican place, with maybe a little bit of macaroni thrown in there. Nope, wings are their specialty. I read their website and the reason behind it makes sense. Long story short; two guys had opened up a wing shop back in the late seventies, and their first place was an old taco stand. The name stuck and they’ve opened up a bunch of locations since then. 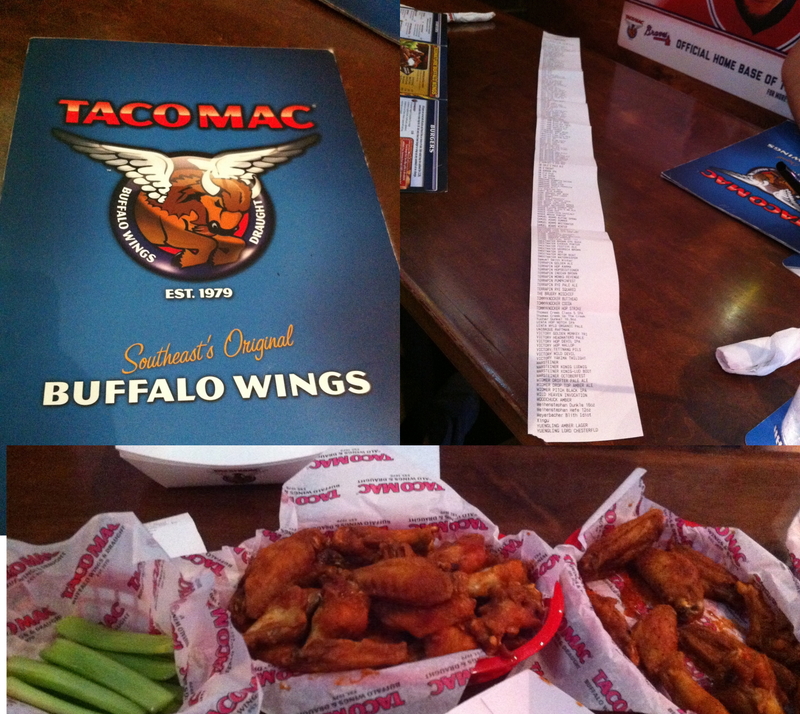 Below is a picture of the front of the menu on the left, a picture of Dave’s Brewniversity progress receipt, and the wings we ordered. Brewniversity is something Taco Mac does to make customers keep coming back for more. They have literally over 100 beers on tap, and even more in bottles, we’re talking hundreds. It’s free to sign up, and you can keep a tally of all the different beers you’ve tried. When you reach certain milestones you get prizes. As you can see from above, Dave has gotten a lot of beer here, he’s up to 207 different beers after yesterday. He told me that him and Bill go there pretty much every Thursday, because Thursday is free glass night. One of Annette and Dave’s kitchen cabinets is almost entirely full of free pint glasses. We ordered 20 hot wings and ten 3-mile island wings (supposedly hotter). They were very good wings and some of the better ones I’ve had in a while, besides the wings I make myself with Frank’s Red Hot sauce. After lunch (which was also my breakfast), we headed back to their house to get ready for the game. I finished up the Friday post and we headed out with Dave, Annette, and Bill. Again we boarded the MARTA at the Chamblee station and took it downtown. 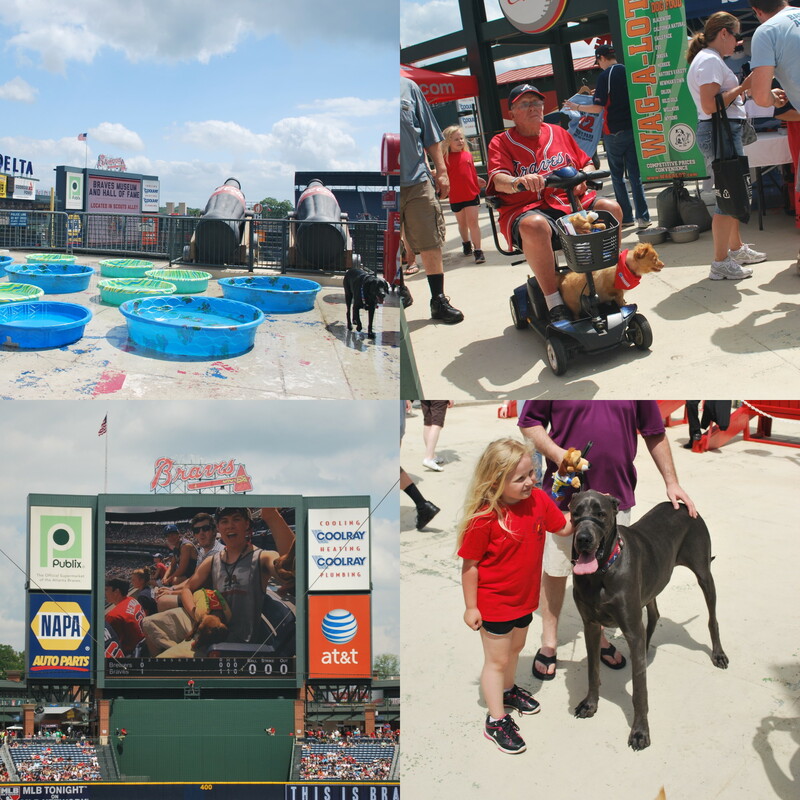 We walked to Turner field again, even though there were shuttles waiting by the MARTA station this time. We were going to tailgate with some of Bill’s friends, and along the way there were a few photo opportunities. 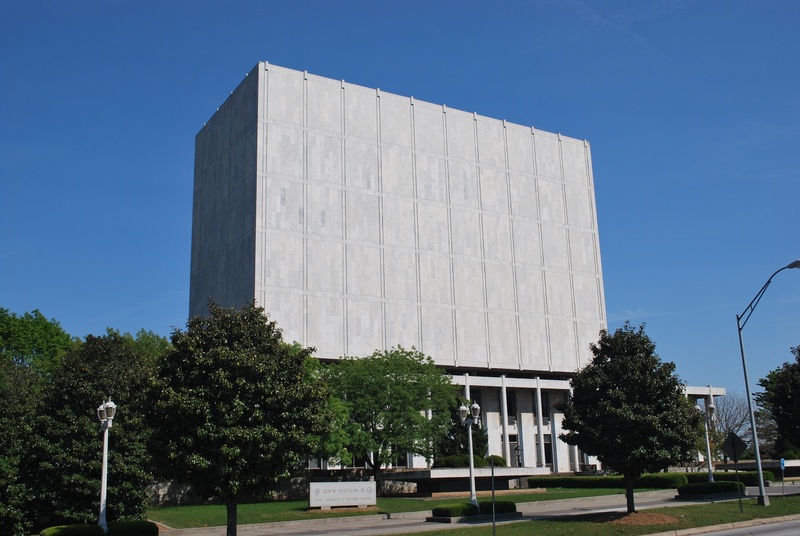 This first picture is of the State Archives and Records Building. 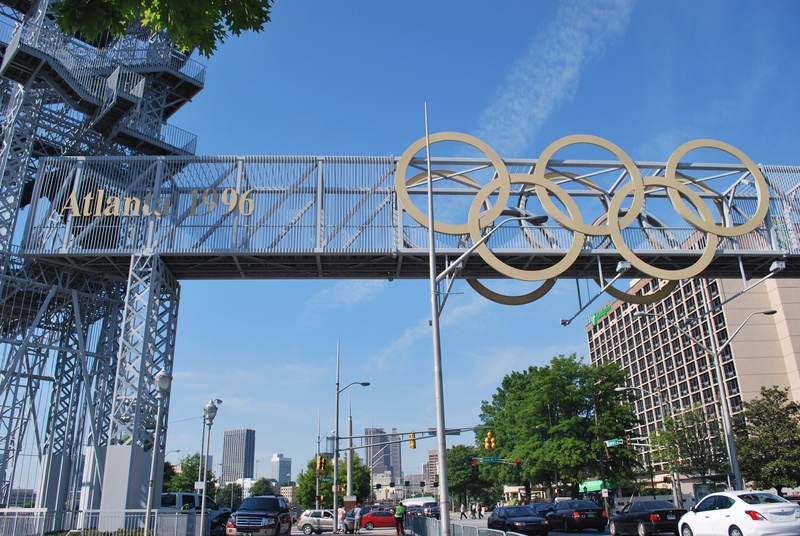 The Summer Olympics were held in Atlanta in 1996, and Turner Field actually served as Olympic Stadium, where it held the Opening Ceremony, the track and field events, and the Closing Ceremony. The stadium was obviously configured differently for the Olympics and had about 35,000 more seats. 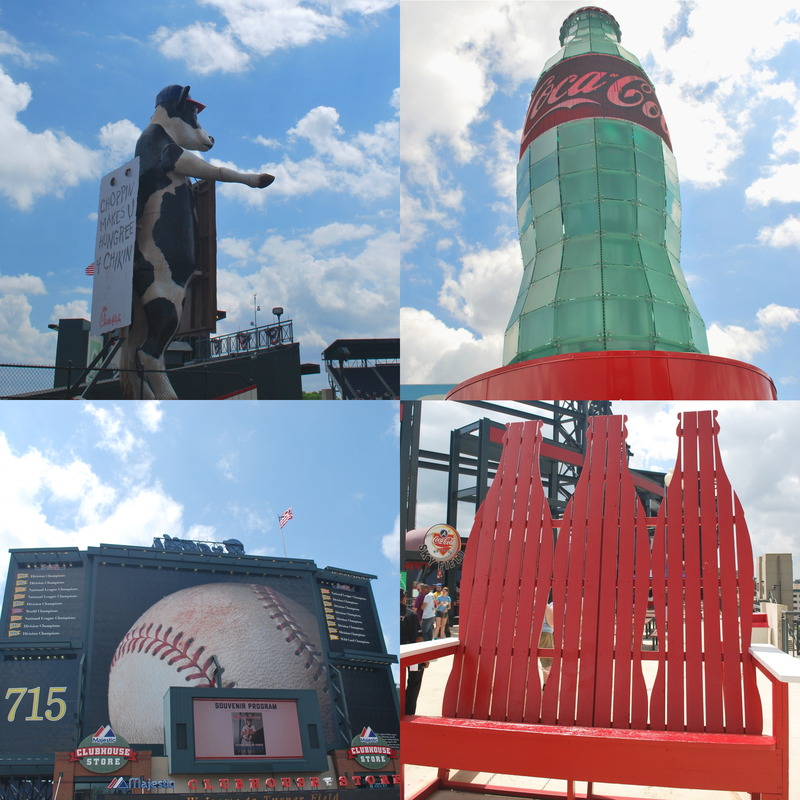 After the Olympics they reconstructed what was basically the outfield section and created a new one, while the seating bowl from foul pole to foul pole remained mostly the same. 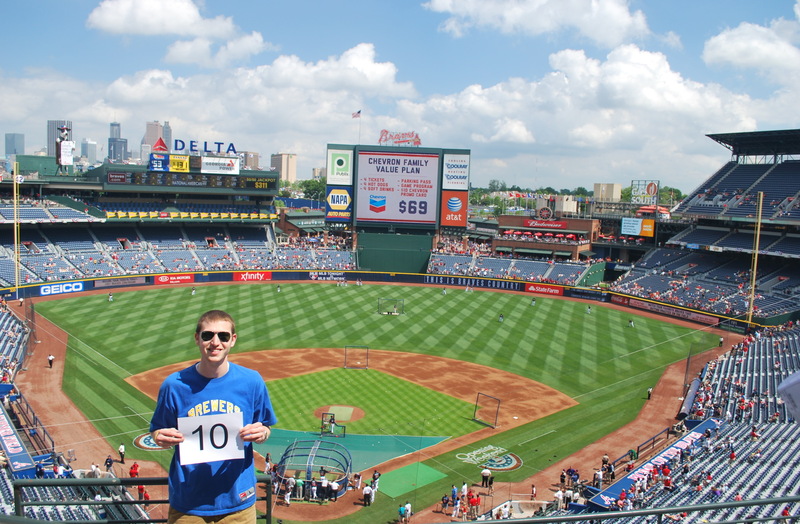 We had some time to kill and went to see the spot where Hank Aaron’s 715th home run landed. 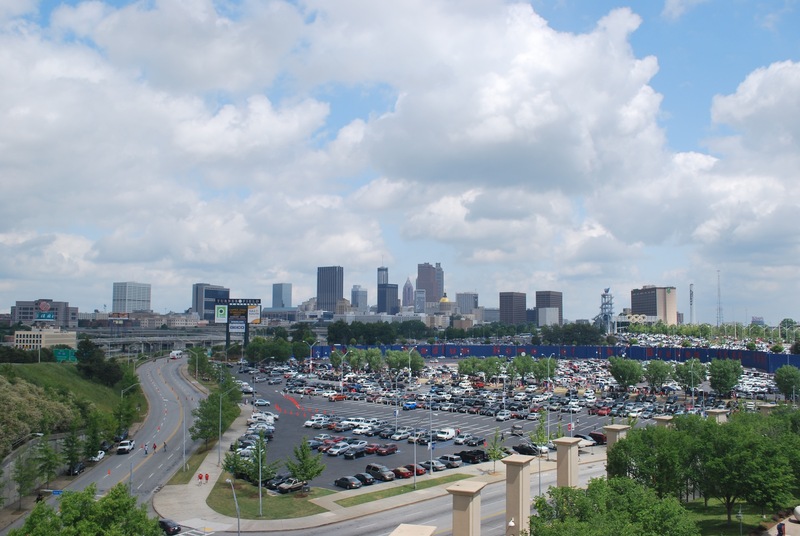 Hank Aaron hit the home run at the now demolished Atlanta Fulton County Stadium, which was torn down in August of 1997, the first year that the Braves called Turner Field home. 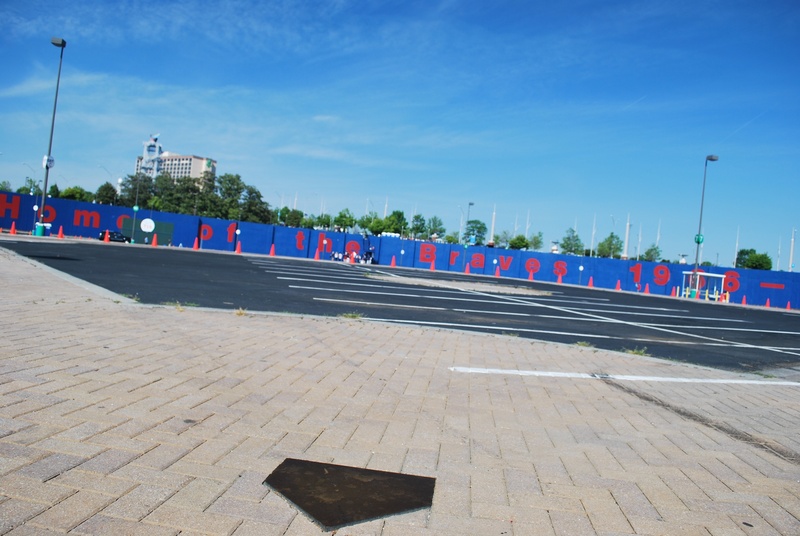 They also have bricks laid out to represent where the infield was amongst the asphalt parking lot. 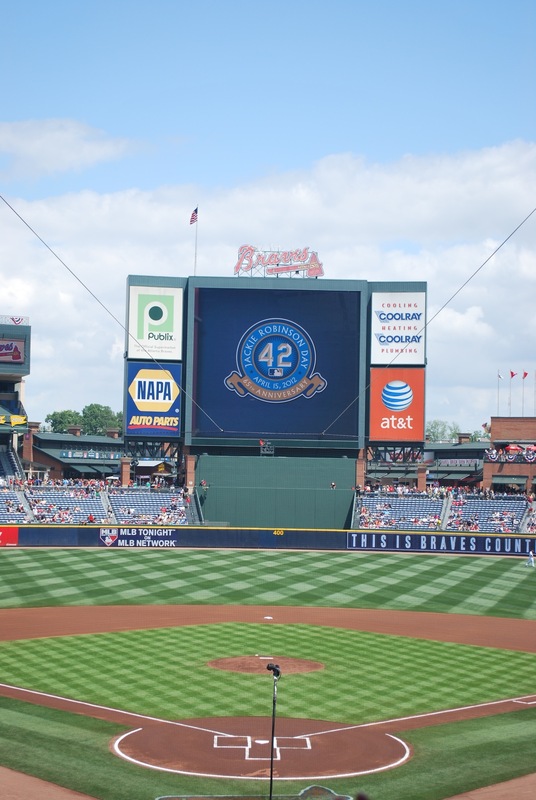 The blue wall had “Atlanta Fulton County Stadium Home of the Braves 1966 – 1996” written on it. 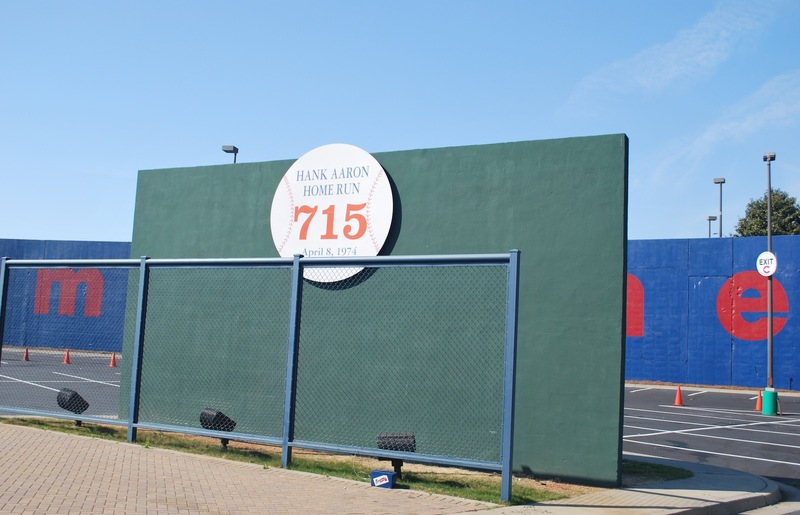 This was the exterior wall of the old stadium, and now it’s used to as a commemorative piece. 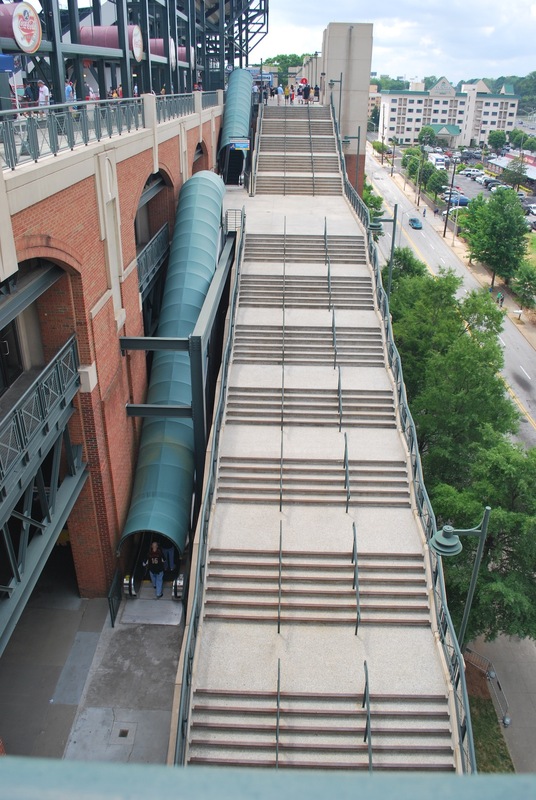 The other side is elevated, and you have to take a staircase to get to down to the side shown above. Dave’s friends arrived and we went over to meet them. There was actually a guy from Milwaukee there, and Annette and him went to schools that were in the same conference. They were one year apart so they knew some people from each others’ schools. His name was Trent and I told him I would give him a shout out, mainly because he thought what I was doing was amazing, and that was cool to hear. I had my sunglasses, and they helped a little, but then they made it difficult to see the ball after it left the pitchers hand. I wound up not wearing them and just shielding my eyes with my hand, and eventually one of those free game day programs that teams give out. As for the game, not too much to talk about. 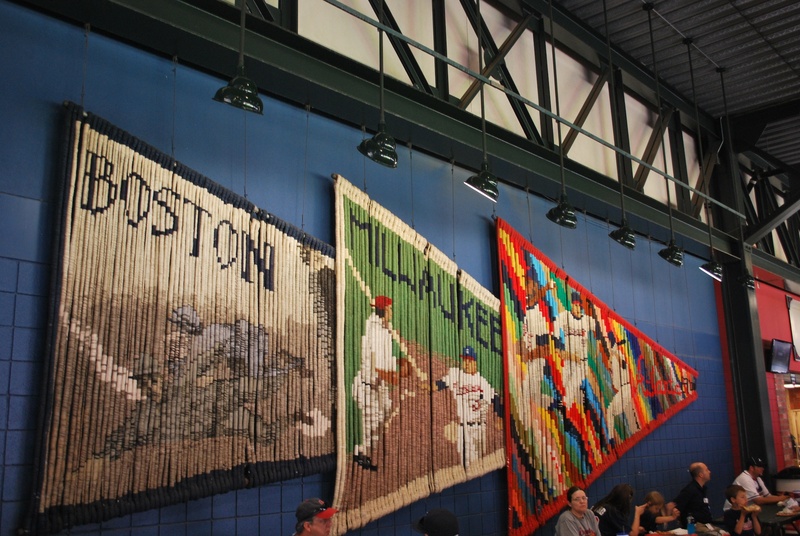 The Brewers had a hit in the first, but not another until the eighth, so there wasn’t much to cheer about between those innings. 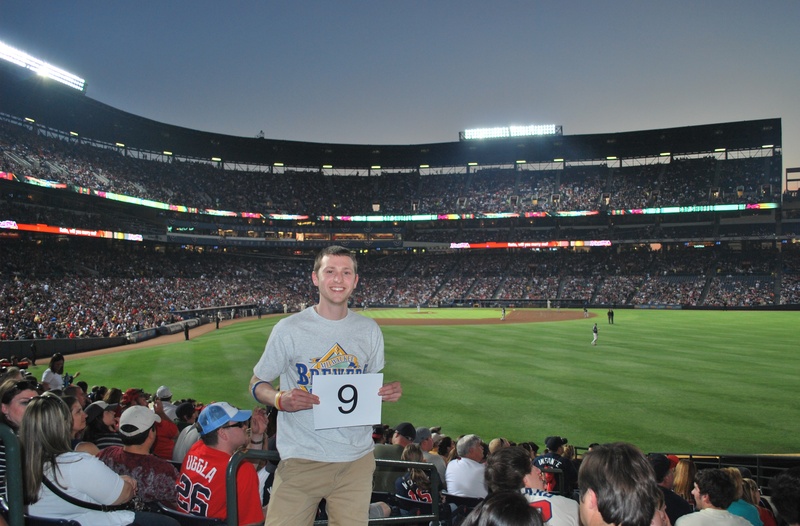 The Braves pushed two across in the second, with the help of a Brewers error. Marcum pitched really well though, and didn’t deserve the loss. He gave up three hits and the two runs over seven strong innings. The Brewers eventually got a run in the 8th, and loaded the bases with only one out in the 9th, but Kimbrell struck out Kottaras and Gamel to end the game. We took the shuttle back to the MARTA stop after the game, and were back to Annette and Dave’s by 11:15. As I write this it’s 10:15 on Sunday, and we’re leaving for the game in less than an hour. We’re already an eighteenth of the way through the season! 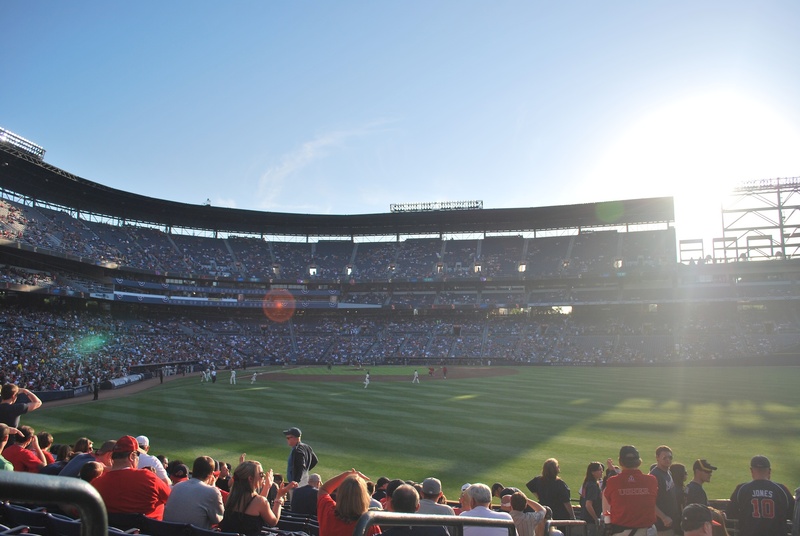 Hopefully today’s game will wind up in the win column.